joy magnetism: "Stingy piece of pie"
That's what one critic called the Flatiron Building when it was finished. 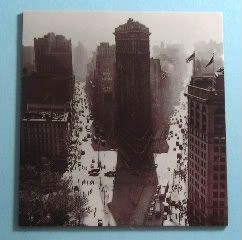 I bought this magnet as part of an historical NYC photographs set from the Met. One of the things I love about New York City, is that it's forever captured in a million ways, in a million places, and in a million eras. This photograph was taken in 1947, by Mr. Burckhardt, a photographer who was, according to this NYTs article, "famous for being underrated." That makes me a little sad, as does this shot of the Flatiron Building. The NYTs article claims this image was kept from greatness because of the "silly phallic shadow of the Flatiron hanging below it, turning the whole mass, building and shadow, into a weird blob floating down the street." I love the Flatiron - and according to lackluster guide on the one and only Gray Line tour I've ever taken in town (don't judge), it's one of the most photographed buildings in town (that, I believe), and supposedly the tallest building in the world at some point (which is totally not true, silly Gray Line). The locals had always called that triangle plot of land flatiron, for the triangle irons of those days. So, when the Fuller Building went up, the name didn't stick (hear that, Sears Tower? ), and Flatiron, it is. I work down the street from this Daniel Burnham beaux arts building - one of the few he did in NYC, and each time I pass it, I can't help but examine it for more cool details. I had a couple of friends who worked in the building, complaining of small and odd-shaped offices. And, Ephemeral NY did a close-up on the faces recently, so who do you think ended up looking like a tourist staring up at the tall building. For me, this building's always had a special place in my heart - since 1985, anyway, when Duran Duran's John Taylor starred in a little-known Sci-Fi series called Timeslip. The opening credits included a triangle building, and I remember squeeing when I figured out the Flatiron was, OMG, same building! What? I was young. And, for almost a quarter of a century I've labored under that sweetly fangurlish belief, that this is where my John hung out as The Hacker. Until today, when I got curious about Timeslip, and did a search. Stupid YouTube video, disabusing me of that silly notion. Clearly, this building is not the Flatiron. Hmph. Talk about a timeslip. Well you know I love the Flatiron. I mean I actually own a piece of jewelry with the Flatiron on it. I think it's a grand building. I remember my first trip to NYC, it all seemed so unreal and when I saw the Flatiron, it hit me, I'm really in NY. I remembered Jimmy Stewart and Kin Novak embracing on top of the Flatiron in Bell, Book and Candle. It seemed to represent everything romantic and sophisticated. Sigh. Oh! I found another factoid! Apparently, in a 1979 interview, Morley Safer asked Katharine Hepburn what it was like being a legend. She said something about it was like being an old building that everyone looked up to, and he asked her what building she'd be, and she said the Flatiron. Nice.